Hibernian secured safe passage to the League Cup second round after goals by Scott Martin, Scott Allan and Jason Cummings disposed of spirited Montrose. Teenager Martin latched on to Alex Harris's pass to fire Hibs ahead. Allan, the subject of transfer interest from Rangers, doubled the lead with a second-half strike after coming on as a substitute. And Cummings stylishly finished for the hosts' third in the closing stages of the match. Midfielder Allan started on the bench after having a transfer request turned down by the Easter Road club. Marvin Bartley made his debut for the club with Harris back from a loan spell at Dundee back in the the starting line-up. The visitors started well and when Hibernian keeper Mark Oxley clattered into Montrose striker Ross Campbell there were claims for a penalty but referee John Beaton allowed play to continue. 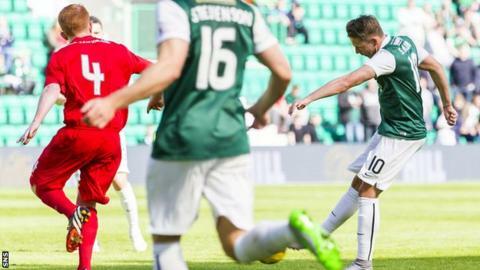 It was midway through the first half before Hibernian had their first strike on goal, Cummings cutting in from the left and sending his effort narrowly wide of target. Cummings threatened again following a terrific touch that allowed him space for a shot but Ross Salmon made a terrific diving save low to his left. The opener soon came with Harris's pass splitting the Montrose defence and 18-year-old Martin duly clipping the ball into the net. Hibs continued to push forward in the second period and Sam Stanton was inches away with a left-foot pile driver. Allan replaced Bartley and the 23-year-old quickly made his mark. He linked up well with Stanton before finding the bottom corner with a low shot. And number three for Hibs came from a corner. Liam Fontaine turned a deep delivery across goal where Cummings turned and hammered in from close range. Match ends, Hibernian 3, Montrose 0. Second Half ends, Hibernian 3, Montrose 0. Attempt missed. Jordan Sinclair (Hibernian) left footed shot from outside the box is close, but misses to the left. Attempt missed. Liam Fontaine (Hibernian) right footed shot from outside the box misses to the right. Substitution, Hibernian. Jordan Sinclair replaces Samuel Stanton. Substitution, Montrose. Declan Milne replaces Ross McCord. Goal! Hibernian 3, Montrose 0. Jason Cummings (Hibernian) left footed shot from the centre of the box to the bottom right corner. Assisted by Liam Fontaine following a corner. Corner, Hibernian. Conceded by Ross Salmon. Attempt saved. Scott Allan (Hibernian) left footed shot from the left side of the box is saved in the top right corner. Corner, Hibernian. Conceded by Ryan Ferguson. Attempt missed. Scott Allan (Hibernian) right footed shot from outside the box is high and wide to the right. Substitution, Hibernian. Oli Shaw replaces Alex Harris. Paul Watson (Montrose) wins a free kick in the attacking half. Goal! Hibernian 2, Montrose 0. Scott Allan (Hibernian) right footed shot from outside the box to the bottom left corner. Attempt saved. Graham Webster (Montrose) right footed shot from outside the box is saved in the top centre of the goal. Attempt saved. Samuel Stanton (Hibernian) left footed shot from the left side of the box is saved in the bottom right corner. Corner, Hibernian. Conceded by Jordan Reoch. Substitution, Hibernian. Scott Allan replaces Marvyn Bartley. Attempt missed. Samuel Stanton (Hibernian) right footed shot from outside the box misses to the right. Substitution, Montrose. Dale Reid replaces Ross Campbell. Corner, Montrose. Conceded by Paul Hanlon. Attempt blocked. Paul Watson (Montrose) right footed shot from outside the box is blocked. Attempt missed. Samuel Stanton (Hibernian) left footed shot from outside the box is high and wide to the left. Attempt missed. Jason Cummings (Hibernian) right footed shot from outside the box misses to the right. Corner, Hibernian. Conceded by Ross Campbell. Attempt missed. Liam Fontaine (Hibernian) header from the centre of the box is just a bit too high following a corner. Corner, Hibernian. Conceded by Andrew Steeves. Second Half begins Hibernian 1, Montrose 0. First Half ends, Hibernian 1, Montrose 0. Attempt missed. David Gray (Hibernian) header from the left side of the six yard box misses to the left following a corner. Corner, Hibernian. Conceded by Graham Webster. Ross Campbell (Montrose) wins a free kick in the defensive half.